A few days back, bright and early in the morning, we heard a plane flying around overhead. By the sound of the powerplant and the fact we could tell it was circling over the house (literally), we knew it had to be one of a small list of people who knew how to get us out of bed. And sure enough we were right. Running to the edge of the patio in my socks and shorts, looking up I could see our good friend Drew Middleton. 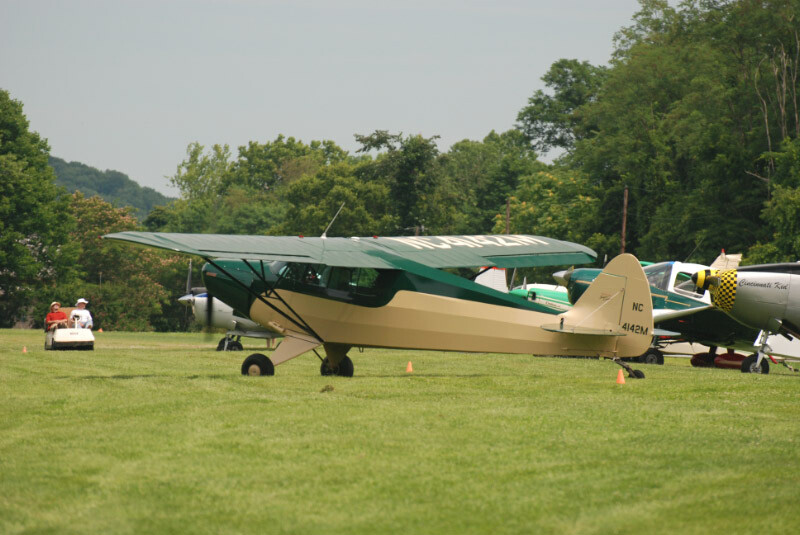 Drew and his family have one of the prettiest PA-12s in the country that comes with a great story to boot. Anyway, seeing this sock wearing idiot (me) waving his arms from a wet patio on a cool morning must have made him feel pity as he called over the radio to see if I wanted to go for a ride. Riding is not something I do well in airplanes but the combination of friend, clear morning, and airplane was something I couldn't refuse and soon we were flying about the area. This brings me to the reason for this entry. As Drew and I flew around in the rising sunlight, he told me the following story. Having heard the many "wive's tales" about cell phones and gee whiz aircraft items, it was something I had long ago accepted as BS but now I know better. If any of you have newer electronics in your aircraft, his following message might save you some money in the future. I thought I would post this for others flying small airplanes. I spent a week this month chasing a frustrating problem in my PA-12. It all started about two weeks ago as I was approaching Bowman field (LOU). As I approached the pattern the tower asked me to "say altitude". I told them 1500 feet. The tower replied that I was showing 1900 feet. A moment later they showed 1200 feet. Basically on every radar sweep they showed a different altitude. After flying around a bit it was clear that my Transponder or encoder was all over the place. Ironically my biannual transponder check was due and I had my radio man coming to the hanger the next day. I called him to inform him that I now also had a squawk with the system. After explaining the problem he suggested I re-rack the encoder as well as the transponder. He figured there was a good chance something was loose. So I climbed under the dash and re-racked both instruments. For good measure I blew compressed air over all the connections. I then took the airplane around the pattern and asked the tower to tell me what they saw. There was no change, my altitude was all over the place. I called my radio man back and told him the results. He suggested that I should replace the encoder. So I grabbed the Aircraft Spruce book and spent some money. I waited 3 days for the new encoder and when it arrived I swapped out the old unit for the new. My flight around the pattern revealed that the problem still existed. Basically the altitude being transmitted from my airplane was hopping up and down as much as 700 feet. I called my radio man again and told him the news. It was clear the encoder was not the issue. He suggested swapping out the transponder with a similar unit. I was able to locate an airplane with a Garmin 320 like mine. To get the replacement transponder I flew to a grass strip just west of Lexington, KY. The gentleman who owned the replacement transponder was very generous. I landed by his hanger and within ten minutes was back in the air with the replacement transponder. I climbed up to 3000 feet, called Louisville Approach and asked them what they saw. Unfortunately they saw me all over the sky. I descended back to the grass runway, swapped out the transponders and headed back to Bowman. It was clearly not a transponder problem. I called my radio man and he decided the next thing to check would be the wire harness running from the encoder to the transponder. I contorted myself back under the dash and removed the harness. We tested each of the 9 wires and could not find a problem, but just to be safe we replaced the harness with a new one. At that point I had to leave for work and my radio man stayed behind. His plan was to hook the encoder up to the transponder and power everything up on the work bench to see if it worked. With his test equipment he pumped up the system to watch it climb. The encoder seemed to be working just fine, and then while it was climbing his cell phone rang. When it rang the encoder altitude jumped a few hundred feet. After he took the call he continued to watch the encoder. Each time he spoke the encoder jumped. You probably know where this is going. I have an I-phone and yes I always have it with me in the airplane. I usually do not use it but I stow it in a map pocket and it stays on. We put the airplane back together. I flew around in the pattern for fifteen minutes (Iphone off) while the tower watched my altitude. It was rock solid right on the money. I landed and then turned on my Iphone. I took off again and immediately the tower saw my altitude jumping all over the place. While talking with the tower I turned the phone off and immediately things returned to normal. My radio man has never encountered this anomaly but is convinced the phone is the culprit. I am as well. By the way the encoder is made by Ameri King. I have an old Ack unit that we put in after discovering this problem and the Iphone does not effect the Ack unit. Hopefully this information will prevent someone else from chasing their tale. Thanks goes out to Drew for this heads up. With that, I would like to share with you what Ginger said after reading it. Her quote, "Well there's just more proof that planes like that aren't supposed to have all that #&$* (crap) in them....it's Karma." No offense to anyone with all that (crap) in their planes. It's just that having been there ourselves, it sure seems like every time you put radios in a nice old plane, the machine's defense mechanism kicks in to rid it of the virus. Now ain't that something? Who'd have thought. They really can interfere with the aircraft's communication and navigation systems. I wonder if the problem goes away when the phone is put into "airplane" mode?